A new interdisciplinary Stanford University initiative called NeuroCircuit aims to find the specific brain circuits that are responsible for mental-health conditions and then develop ways of noninvasively stimulate those circuits to potentially lead to improved treatments for depression, anxiety, and post-traumatic stress disorder. Etkin has been working with transcranial magnetic stimulation (TMS) to map and remotely stimulate parts of the brain. 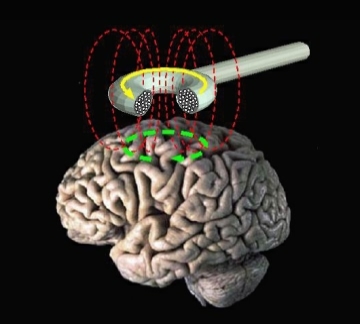 A TMS device generates a strong magnetic field that stimulates brain circuits near the surface. TMS is currently used as a way of treating depression and anxiety, but Etkin said the brain regions being targeted are the ones available to TMS, not necessarily the ones most likely to treat a person’s condition. They are also not personalized for the individual. The solution may involve combining TMS with ultrasound. In his lab, Baccus has been using ultrasound to stimulate nerve cells of the retina to develop a prosthetic retina. Other members of the team are modifying existing ultrasound technology to direct it deep within the brain at a safe frequency. If the team is successful, ultrasound could be a more targeted and focused tool than TMS for remotely stimulating circuits that underlie mental health conditions. The initiative is part of the Stanford Neurosciences Institute‘s Big Ideas, which bring together teams of researchers from across disciplines to solve major problems in neuroscience and society. Stanford University/Kurt Hickman | Researchers hope to find the brain circuits that are responsible for mental health conditions, develop ways to remotely stimulate those circuits, and potentially treat those conditions. Magnetic and now ultrasound treatments for mental condiitons: we live in interesting times.